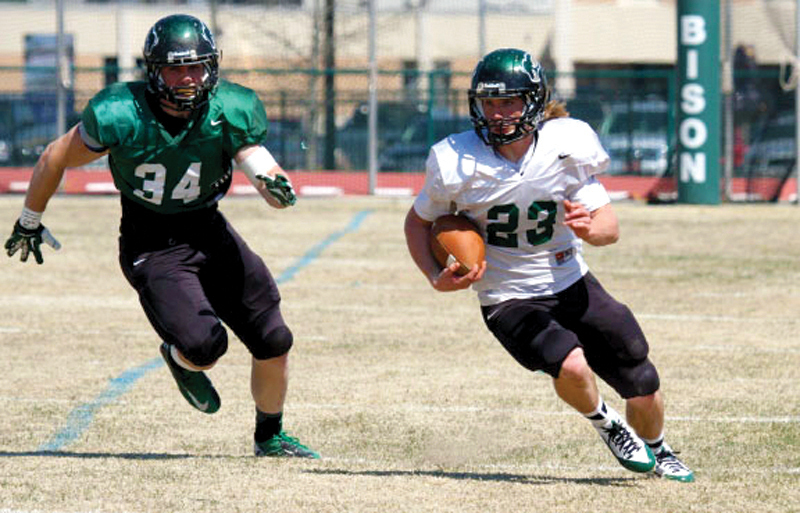 Dawson Myers, 23, led the OBU White team with 12 carries for 61 yards. SHAWNEE—Defense got the stops but Oklahoma Baptist University head coach Chris Jensen was pleased with both sides of the ball in the Bison Spring Game, won by the White squad, 10-7, in double overtime on Sat., April 5. Without special teams participating, the agreement was that in overtime, any possession inside the 15 resulted in a field goal if the offensive team wanted it. Dawson Myers carried 15 yards to the two in the second overtime to give White the 10-7 win. White broke out on top in the first quarter with a 20-yard touchdown pass from Blake Woodard to Ross Britt. Green tied it with 4:09 left in the first quarter with a Cooper Koons to Eric DeLay pass from 27 yards out. Woodard was 9 of 16 for 58 yards to lead White, while Green got 96 yard from Koons on six of 15 passing. Jordan Barnes led the Green rushing attack with 44 yards on 16 carries while Myers led White with 61 yards on 12 carries. DeLay led Green with two catches for 57 yards while Cy Stallard had four receptions for 21 yards for White. Defensively, Eugen Estes and Mario Henderson had interceptions for Green and Clint Wilson had one for White. Kimes Gilbert forced a fumble for Green. Christian Doty had two sacks and team-high nine tackles for White. Tyler Day had 10 tackles to lead White, including a sack.